Tristan da Cunha, 1 Crown, 2018. United Kingdom, 5 Pounds, 2018. Note: The coin incorporates the couple's official engagement photo by Alexi Lubomirski. 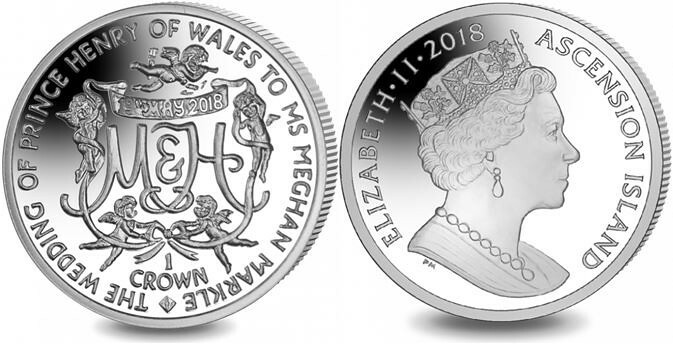 As for this coin, the original lettering was going to be "The Wedding of Prince Henry of Wales to Meghan Markle". Prince Harry however did not approve of that. He wanted a 'title' for Meghan too. So 'Ms' was added to the lettering. Ascension Island, 1 Crown, 2018. I imagine that they planned duchess of sussex for her, but she had to get hitched for the title. Which strikes me, apart from the Queen herself and Chuck, did any other Royals from Magareth onwards actually marry fellow aristocrats? I am with the aristocrats there. There was a time when inheriting land from another family was so important that women became chess pieces, to be married off to the wealthiest available party. Within the family if necessary. The most horrible of these political marriages was probably that of Charles II and Maria Anna of Neuburg. Just imagine Maria Anna's heroic attempts to produce an heir to the throne with a man who was severely disfigured, invalid, out of his wits and impotent anyway. All this was papered over by stupid, counterproductive talk about bloodlines. Glad it's over at last.